Eurodollar is still moving downwards and reaching new minimums. If price breaks level of 38.2%, it will continue falling down towards level of 50%. Stop on my sell order is already in the black. As we can see at H1 chart, local correction reached only level of 23.6%. Market rebounded from this level and started moving downwards again. According to analysis of temporary fibo-zone, predicted targets may be reached either by the end of Friday or in the beginning of the next week. Franc continues moving upwards; market hasn’t formed any significant correction yet. Most likely, in the future pair will continue growing up towards level of 50%, which may later become starting point of another correction. 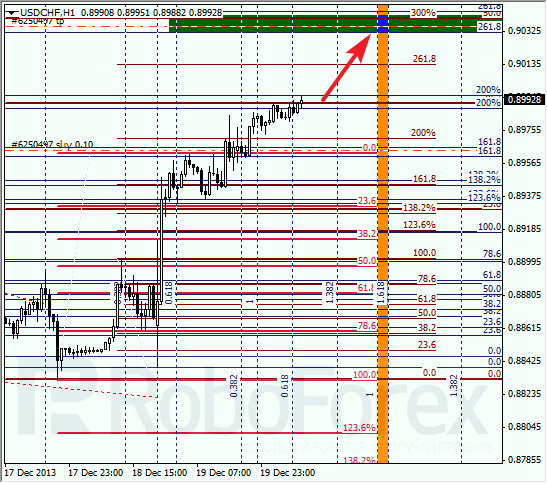 At H1 chart we can see, that local correction reached only level of 23.6%. According to analysis of temporary fibo-zones, predicted targets may be reached very soon, but I’ve decided to move stop into the black, just in case.